NEW DELHI: Technology major Infosys will take over the Corporate Affairs Ministry's ambitious e-governance initiative MCA-21 from tomorrow. Infosys would take over the programme from its rival Tata Consultancy Services (TCS). The second phase of the e-governance initiative would, among others, see gradual replacement of desktops, printers and scanners. It is designed to fully automate all processes related to enforcement and compliance of the legal requirements under the Companies Act. "The operator for MCA-21 project is changing with effect from tomorrow from TCS to Infosys," the Corporate Affairs Ministry said in a public announcement. The second phase of MCA-21, from January 2013 to July 2021, has a total project outlay of Rs 357.81 crore. The amount includes Rs 54.42 crore for independent project management and certification, besides Rs 29.84 crore for continuous improvement and upgradation to the electronic service delivery of the Corporate Affairs Ministry. 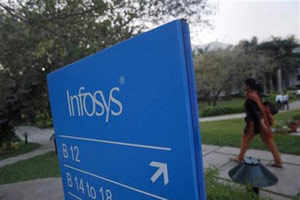 Infosys bagged the MCA-21 contract for a period of five years for about $50 million in November last year. The IT firm had said it would revamp the existing application after the transition from the incumbent vendor and manage the overall transformation. The new features of the latest phase of MCA-21 include replacement of existing desktops, printers and scanners as well as replacement of out-of-support servers and associated infrastructure. Among others, MCA-21 envisages electronic filing of documents, registration of companies and public access to corporate information online through a secure interactive portal.